There are over 300 books by Jane Yolen to choose from to read with your family this week! I easily filled a whole bag on my trip to the library. There are picture books, easy readers , graphic novels, poetry books, and many novels. I was so excited to find the book Fairy Tale Feasts: A Literary Cookbook for Young Readers and Eaters. Jane Yolen wrote this book with her daughter Heidi E.Y. Stemple. This book is about the interconnection between stories and food. "From the earliest days of stories, when hunters came home from the hunt to tell of their exploits around the campfire while gnawing on a leg of beast, to the era of kings in castles listening to the storyteller at the royal dinner feast, to the time of TV dinners when whole families gathered to eat and watch movies together, stories and eating have been close companions." There are 25 recipes, that are matched with a fairy tale, for all the meals of the day including soups and desserts. The Little Mermaid has a recipe for Seaweed (spinach) Stuffed Shells and after reading Cinderella you can bake Pumpkin Tartlets. As I read through the list of recipes my son cheered for "Perfect Porridge" that accompanies the story The Magic Pot of Porridge. We also tried Snow White's Baked Apples which tasted delicious. 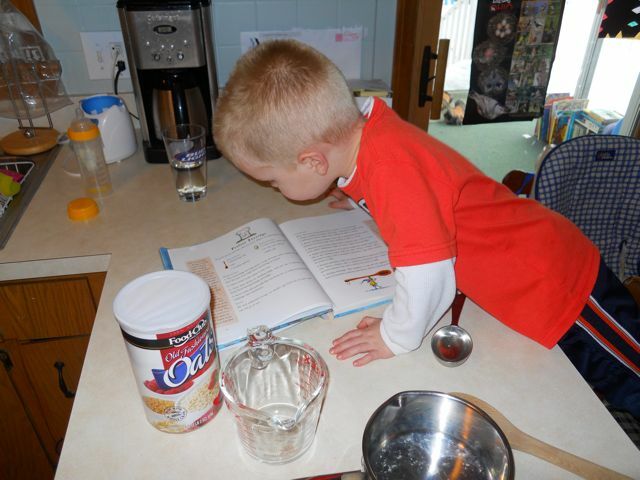 This book and its recipes were perfect for our family during this coldest week of the year. 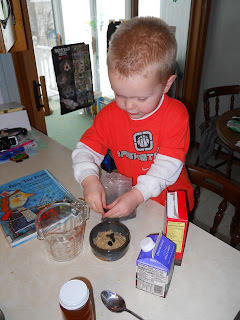 Checking to make sure we have everything we need to make porridge for an afternoon snack. Adding raisins and honey. Next time he wants to add jellybeans! 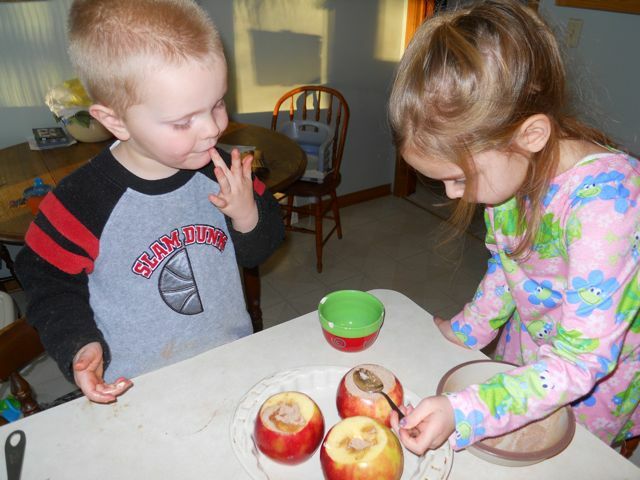 We made Snow White's Baked Apples for an evening treat! 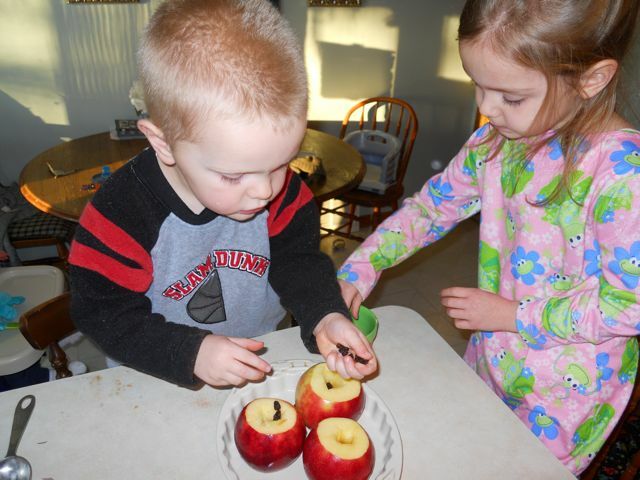 Cinnamon sugar, raisins, and butter were stuffed into the core of the apples! Yummy! Last year to celebrate Jane Yolen's birthday we participated in the Great Backyard Bird Count. We will once again be participating in the event which is being held February 18 - 21, 2011. The activity is very simple. First, you download your regional bird Tally Sheet, then you spend at least 15 minutes watching for birds in your backyard, and then you submit your results on the website. (Click here for more detailed instructions.) Jane Yolen has written many books that can be read before, during, and after this activity including her beloved Owl Moon, Bird Watch, Elsie's Bird, Birds of a Feather, and Wild Wings: Poems for Young People. At 71 (72 next week), I have forgotten most of my birthdays. And so I get to look forward especially to the new one. I no longer want presents because I am divesting myself of a lifetime's accumulation of STUFF. But, I love to have birthday flowers or boxes of birthday apples because those can be gotten rid after they are done with. And birthday hugs are always wonderful. Some of my children, grandkids, and friends write me birthday poems. The best!! Thank you Jane for responding! We have really enjoyed reading your books this week! We hope you have a wonderful birthday filled with lovely poems and maybe some Snow White's baked apples! In closing, if you like graphic novels, I encourage you to check out Foiled by Jane Yolen. This was a book I enjoyed by myself this week. Instantly, I connected with Aliera Carstairs, a young high school student who is very talented at fencing. She doesn't quite fit in with the cliques at school and the time spent in the gym practicing doesn't help the matter. Additionally, her new science lab partner, Avery Castle, an attractive new boy at school, adds more emotions to her already busy life. Interestingly, Avery, fencing, a garage sale purchase, and role playing games become connected in an event that shapes this book into being the introduction to a great series of graphic novels. You could devote a whole year's worth of posts to Yolen! I enjoyed her reading about her birthday desires and that fairy tale cooking book looks like a fun one to read in the kitchen. The apples look scrumptious. I love the fairy tale cookbook you featured here. I must have it! I just got How Do Dinosaurs Say I Love You for my grandson for Valentine's Day. Great book! I am really excited to pick up the fairy tale cook book. I think my kids would love this one! Thanks, Eric! I just read a wonderful Jane Yolen picture book yesterday ~ 'My Uncle Emily' and I'm awaiting the arrival of another book of hers I'd ordered. This one sounds great, too! We read My Uncle Emily last year around her birthday. We enjoyed it too. I really liked Gib! It was a Jane Yolen book that first sparked my desire to illustrate children's books! I still have my copy of An Invitation to the Butterfly Ball (quite tattered)and I've re-illustrated it many times over the years, I love it so.